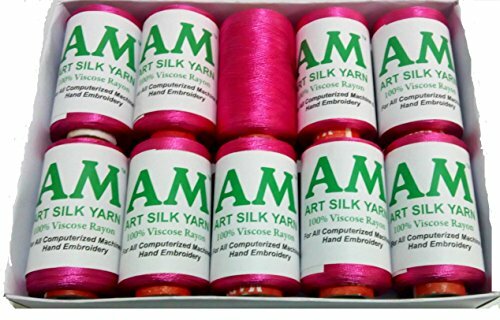 Viscose Rayon Silk for Machine Embroidery /Bangles-earrings-jewelry making . Made from 100% natural viscose filament. Exceptionally strong and color-fast. Product of choice for many high-end designers in the garment industry for their embroidery designs. Use it for embroidery, to make beautiful jewelry pieces, festoon work, ornamental seams, and many other decorative applications. Available in a beautiful array of colors, highly lustrous, colorfast and and has both a high breakage resistance and a high abrasion resistance. Colorfast, both washable and dry cleanable. Best for computerized designs too. Beautiful silk luster makes decorative, excellent embroidery designs.